Brian Miller is fulfilling a life-long dream. 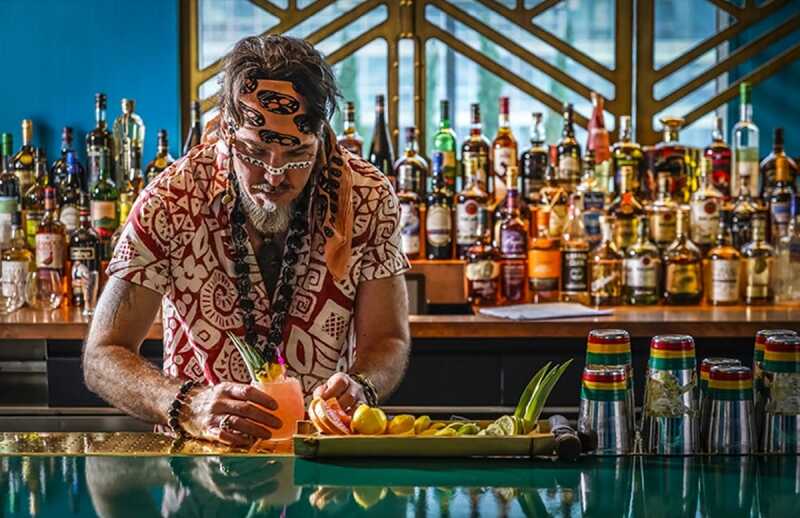 Now a year in the making, the team from Major Food Group (Carbone, ZZ’s Clam Bar and The Lobster Club, to name a few) has finally opened their much-anticipated tiki bar, The Polynesian, in the heart of Midtown Manhattan. “Tiki Apostle” Brian Miller behind the bar at The Polynesian. 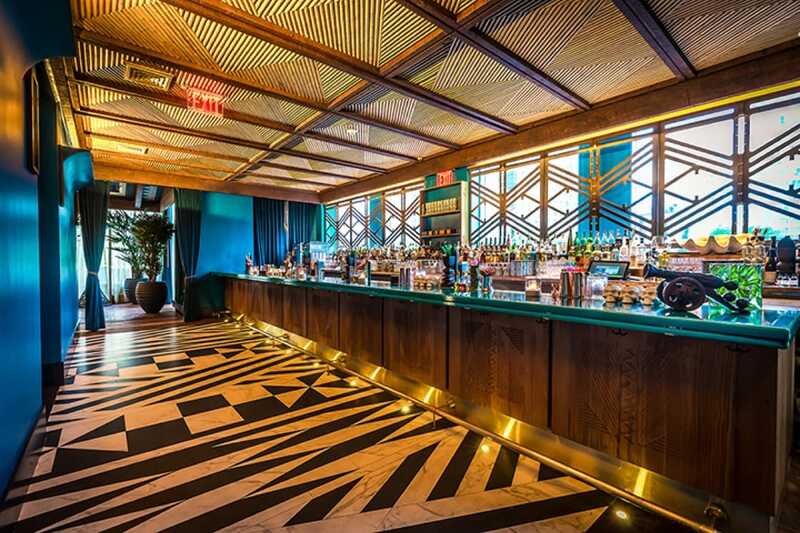 Led by the group’s affectionately-named “Tiki Apostle,” Brian Miller, the new watering hole on the third floor of the Pod Times Square hotel accommodates 200 guests for mingling between its indoor space and large outdoor terrace. Designer Vanessa Guilford gives a nod to tiki culture with rich turquoise hues, a lava stone bar, hand-painted landscape murals and privacy screens resembling meddo stick chart navigational tools. The drinks are what you come here for, and Miller does tiki culture justice by offering the city’s largest rum collection along with 19 original drinks (starting at $15) and four large format cocktails perfect for groups. 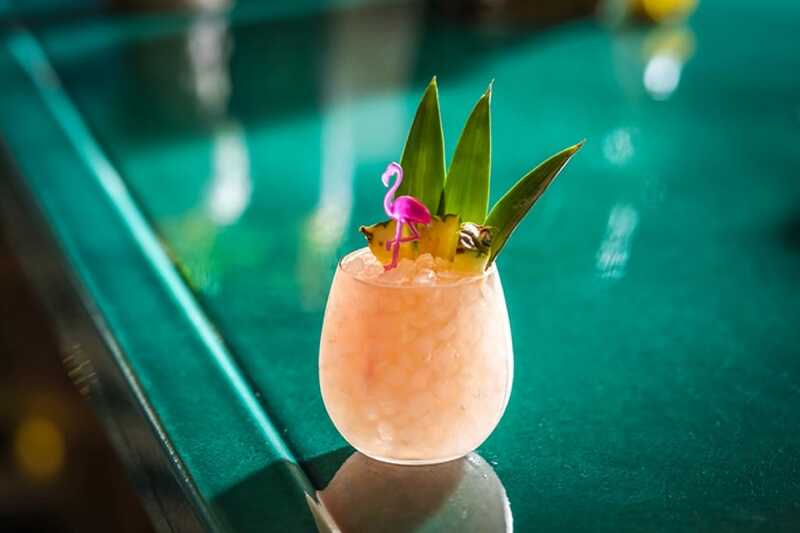 New drinks include the “Jungle Booby” with mezcal, tequila, Campari, absinthe, orgeat, and lime, grapefruit and pineapple juices; and the “Damned to the Depths,” Miller’s tribute to the famed Don the Beachcomber’s Pearl Diver. No tiki bar is complete without something lit aflame—the “Vaya Kon Tiki” is a blended concoction of coconut rooibos-infused rum and cayenne coconut cream served in a custom ceramic skull chalice and topped with a rum floater fireball inside a hollowed-out lemon half. True to Major Food Group form, the food reflects the vibe; elevated takes on nostalgic tiki classics include crab rangoon, delicate pork spring rolls, coconut shrimp, jerk chicken satay and the always crowd-pleasing pu pu platter. Officially open for business today, The Polynesian is located at 400 West 42nd Street. Hours are 4:00 p.m. to 2:00 a.m. on Monday through Friday and 12:00 p.m. to 2:00 a.m. on Saturday and Sunday. Mahalo, Mr. Miller, we’re so excited The Polynesian is here.